The 3-mile long march began at around 10;45 Am. With the student groups like Kappa Psi Epsilon, Chi Rho , XPO, TBD, Samahang Pilipino at UCLA, Kababayan of UC Irvine. Katipunan UC Riverside, CalPoly BARKADA, FASA from CSUN, Long Beach PAC, San Marcos, Andres Bonifacio Samahan from San Diego,SDSU to mention a few leading the way. They were joined by student activist groups from Pro People Youth KMB, ANSWER-LA, BANTAY PILIPINAS-USA, EPCC, AJLPP, the EFJPP while ve veterans and widows from the Society of Guerilla and Scouts (SGS), United Filipino American Veterans (UFAV), VFP-UC Chapter, AWARE-LA, Seniors for PACE (SPACE ) rode in the vehicles. Big streamers calling for recognition, justice and equity as well as immigrant rights were very prominent. Filipino, AJLPP and KMB flags flew high and proud during the march. The youth and advocates shouted slogans all the way. Los Angeles—" Don't Say No. No to My Lolo, Give them Equity NOW! On Veterans Day, more than seven hundred students,, veterans and widows with community marched for more than three miles from Historic Filipinotown district to the Downtown Federal building to demand recognition and benefits to the remaining 60,000 veterans and widows in the US and in the Philippines. The day began with the pre-rally program held at SIPA at 9;45 AM.with the singing of the two anthems. UCLA Tinig and Cal Poly Pomona sang the anthems After that , Fr. Ike Ymson of the Precious Blood Church gave the invocation. And then the opening remarks was given by Mark Masaoka of People’s CORE. While Ernest Tamayo III gave the response for SIPA as the host. Cultural numbers: a poem, a song and a folk dance were presented then by the Seniors of Silverlake Adult Day Health Care Center. Martial Music was provided by the Ube Family of the FCC who played patriotic and modern songs. Veteran Jack Vergara/.Heidi Dela Torre and a Carson veteran also spoke. They were introduced by Paz Velazquez from Carson Community A poem was give by Mrs. Jovy Alejandro of PACE and AWARE-LA and the final speaker was Mel Ilomin of Senator Gil Cedillo’s office. The 3-mile long march began at around 10;45 Am. With the student groups like Kappa Psi Epsilon, Chi Rho , XPO, TBD, Samahang Pilipino at UCLA, Kababayan of UC Irvine. Katipunan UC Riverside, CalPoly BARKADA, FASA from CSUN, Long Beach PAC, San Marcos, Andres Bonifacio Samahan from San Diego,SDSU to mention a few leading the way. They were joined by student activist groups from Pro People Youth KMB, ANSWER-LA, BANTAY PILIPINAS-USA, EPCC, AJLPP, the EFJPP while ve veterans and widows from the Society of Guerilla and Scouts (SGS), United Filipino American Veterans (UFAV), VFP-UC Chapter, AWARE-LA, Seniors for PACE (SPACE ) rode in the vehicles. Big streamers calling for recognition, justice and equity as well as immigrant rights were very prominent. Filipino, AJLPP and KMB flags flew high and proud during the march. The youth and advocates shouted slogans all the way. 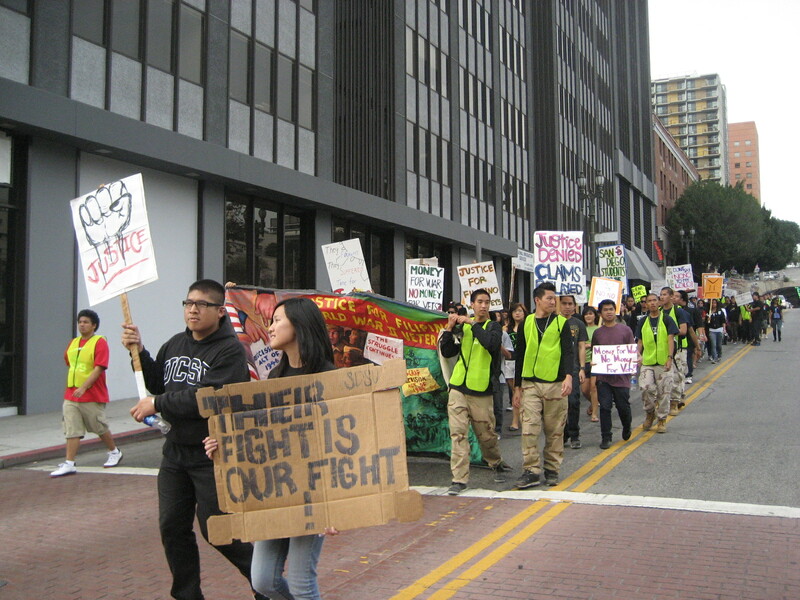 The march/rally was well covered by the local media led by Balitang America, KPFK,Examiner .com and others. The mainstream media were not present like the big TV networks and big bourgeois outlets like the LA Times.